The world expects the Christian to be different and looks to him for something different, and therein it often shows an insight into life that regular church-goers often lack. The churches organize whiste-drives [social gatherings to play cards], fetes, dramas, bazaars and things of that sort, so as to attract people. We are becoming almost as wily as the devil himself, but we are really very bad at it; all our attempts are hopeless failures and the world laughs at us. Now, when the world persecutes the church, she is performing her real mission, but when the world laughs at her she has lost her soul. And the world today is laughing at the church, laughing at her attempts to be nice and to make people feel at home. My friends, if you feel at home in any church without believing in Christ as your personal Savior, then that church is no church at all, but a place of entertainment or a social club. For the truth of Christianity and the preaching of the gospel should make a church intolerable and uncomfortable to all except those who believe, and even they should go away felling chastened and humbled…. We have lost the idea and view of life which was so forcefully stressed and emphasized by the Puritans and the founders of the churches to which we belong, the idea that life is a pilgrimage and that while here on earth we are nothing more than travelers…. 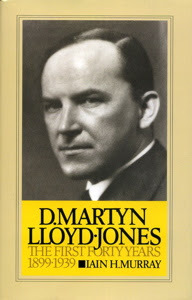 Source: Iain H. Murray, D. Martyn Lloyd-Jones: The First Forty Years 1899-1939 (Banner of Truth, 1982): pp. 142-143. May the Lord continue to shape us into being his pilgrim people! Great reminder for our postmodern time!